In 2017 OSRAM was honored with the coveted “Global SSL Showcase Top 100 Award” from the International Solid State Lighting Alliance (ISA) for the third time in a row. 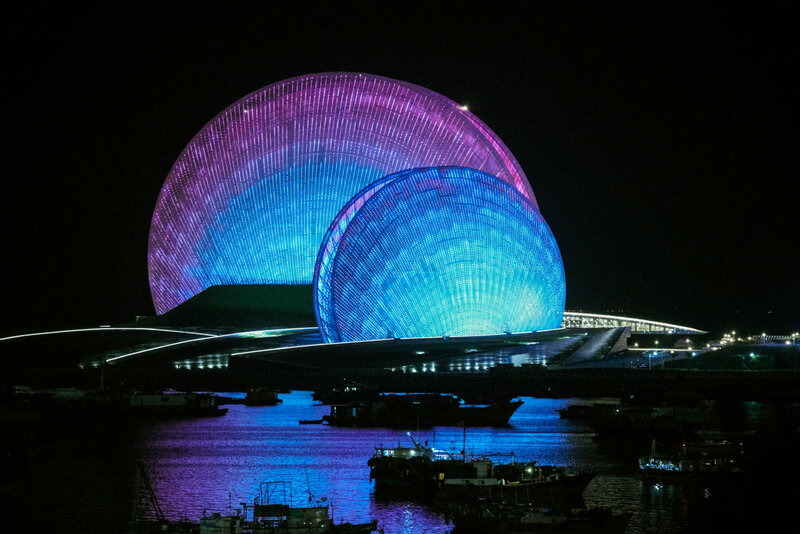 The spectacular dynamic LED façade lighting for the new Zhuhai Grand Theatre was the project that was greeted with enthusiasm by the jurors this time, offering citizens and tourists in the southern Chinese city an unforgettable dynamic LED experience. Zhuhai translates as “pearl and sea”. The new opera house and landmark of the city also embodies this meaning in its unique architecture. Two gigantic 90 and 60 m high “shells” accommodate a 1,550-seat concert hall and a 500-seat theater. Thanks to dynamic LED façade lighting from OSRAM Lighting Solutions the entire ensemble is even more spectacular, especially at night. Traxon Dot-XL 9 RGB units with a total of 51,000 pixels are installed behind the double-sided perforated aluminum façades of the Zhuhai Grand Theatre. Using the colorful, individually controllable LED dots, spectacular lighting and video animations can be realized on the “shells”. As standard, the animated content shows different scenes from the sea, depicting the history of Zhuhai as a major fishing port in the Pearl River Delta. The lighting can be easily adapted to special seasonal events and celebrations at any time. Nine e:cue Butler PRO and one e:cue LCE2-fx are used for programming and replaying images and animations.